First and foremost, I’m going to have to give a shout out to my family – my wife and son for the BEST Father’s Day present … EVER. They got me a brand new Corvette! Over the past several days, I have found them sneaking around, locking themselves up in my office. One day after work, I shouted up to them “hey come down here, you two – I’m getting lonely!” Well, it was all worth it. 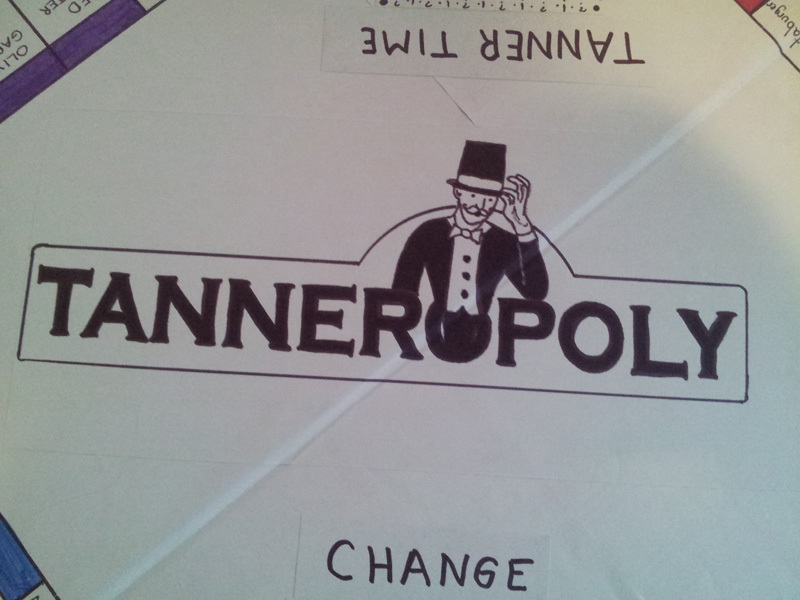 If you know me, you know I am a bit of a Monopoly buff. Not that I play it all the time or anything, but I get a little crazy when I do. House rules say you can put as many houses and hotels on a property as you want. That is what really gets me going, but that is another story altogether! 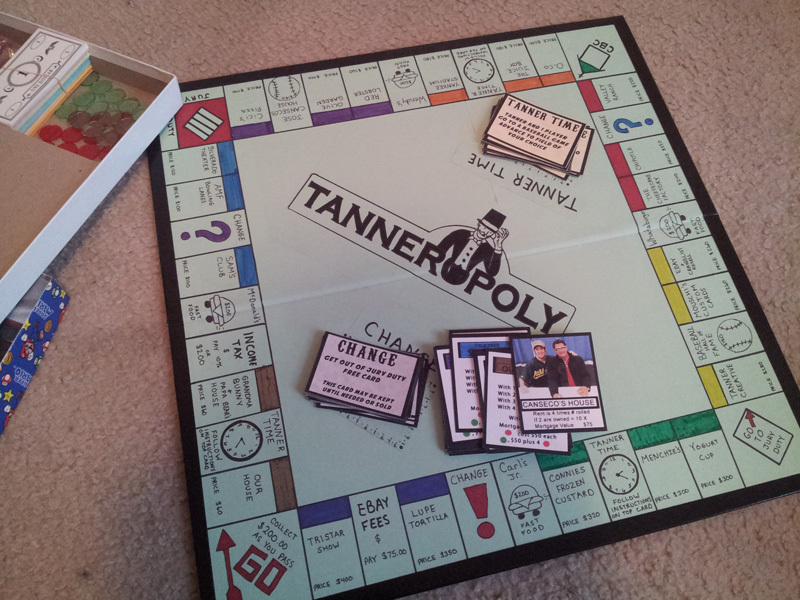 Take a look at the newest game: TANNEROPOLY! All the pictures on the cover are of me/them over the past few years. 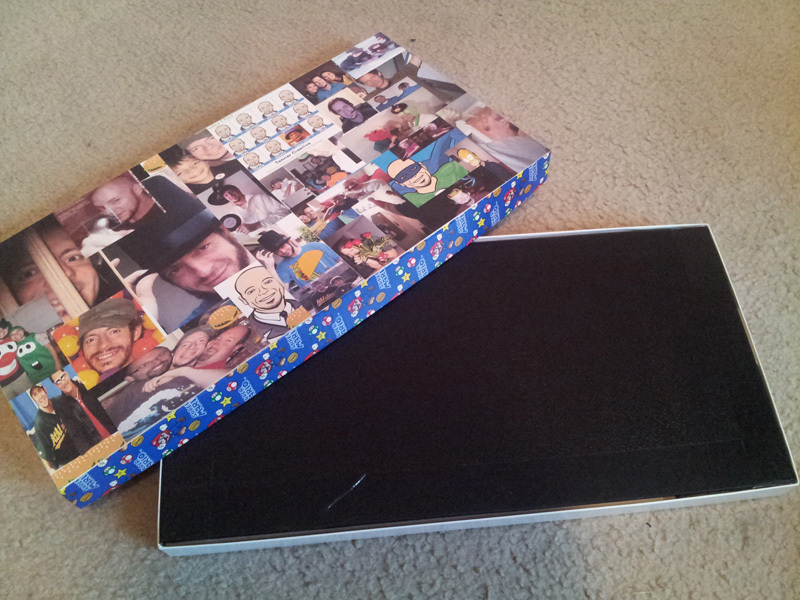 The sides are super mario brothers duct tape. 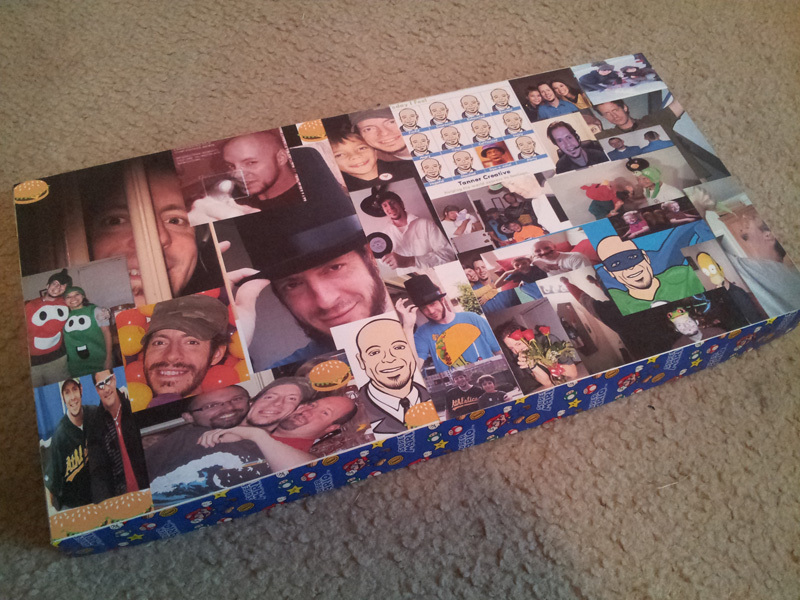 The board is made up entirely of custom places that I like. For better or worse, 90% of them are food joints. They know me so well! 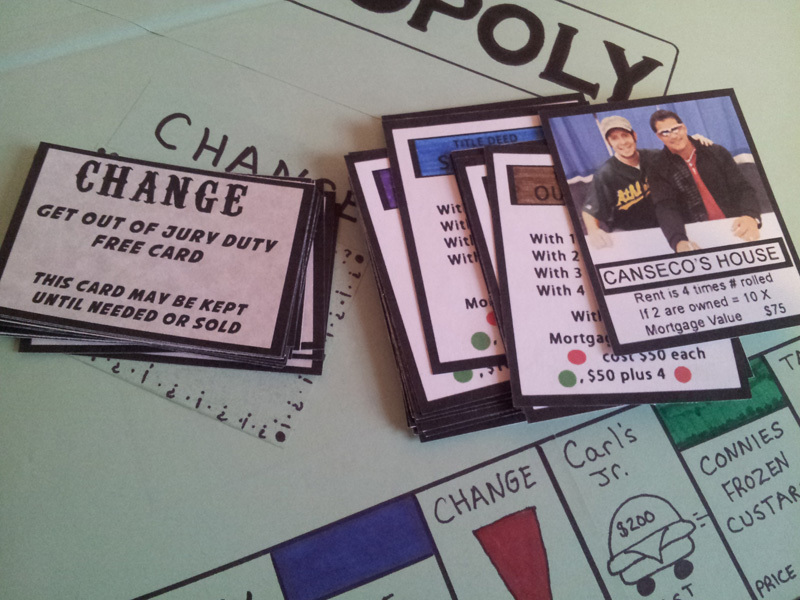 Check out the property cards – one w/me and Canseco. Yeah, he probably should not see this or he will think I’m a stalker. The Chance cards are called “CHANGE” because my wife knows I am not the biggest fan of change. 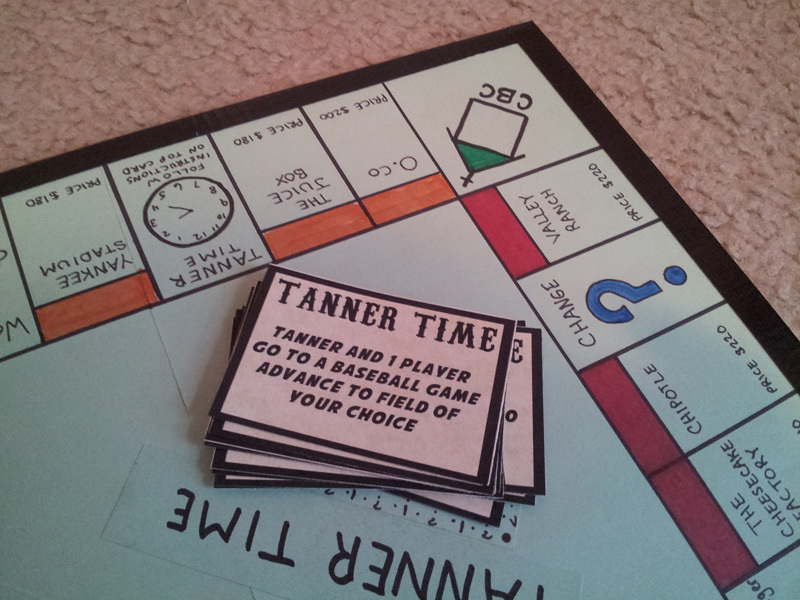 Last but not least, the Tanner Time cards! Absolutely floored – and thrilled. We will be taking this over to my folks house to play later today. Okay, onto the customs! If you haven’t noticed, the online card community has some real scum bags, but there are also some very generous people on here. One of whom, as I have written about before is cnewby. He hit me up asking if I wanted a 1995 Clippers basketball program signed by some Derek Jeter guy. 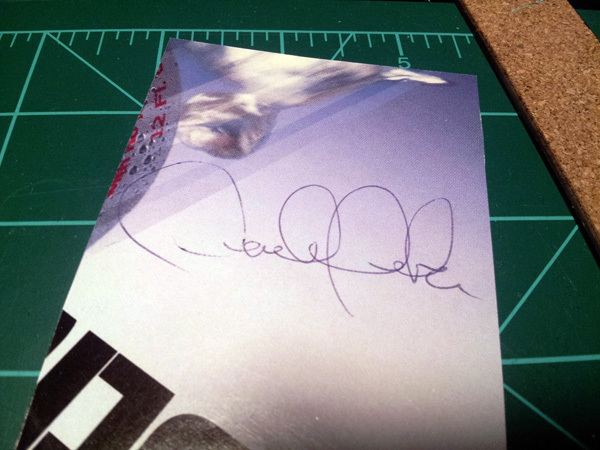 Who, the face of baseball’s autograph? Uhmmm … YES PLEASE!!!!!!! I have spent a good amount of time on and off working on a design to put this bad boy in. Some were washed out because the design was too white. Some were too black, and several were mess-ups due to horrible, HORRIBLE machinery failure here (not joking – custom card making is NOT for the faint of heart! lol) I had to go to several online shops, multiple stores around here, and finally got situated – for now. 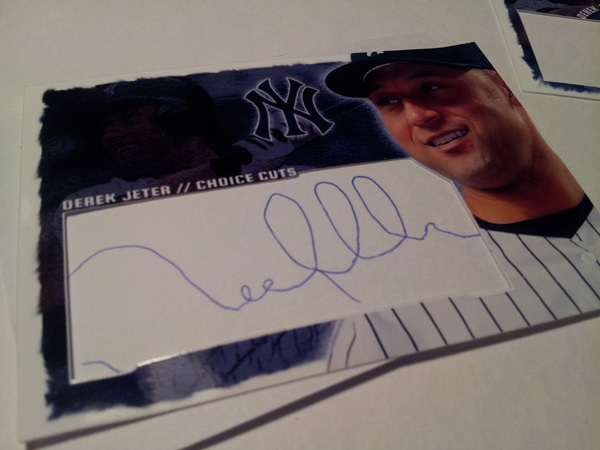 I wanted a card to commemorate the #1 reason why the captain will make it to the hall: His 3000th hit. I didn’t just want it to be a “tribute” card. I wanted his likeness to be fully displayed as well. 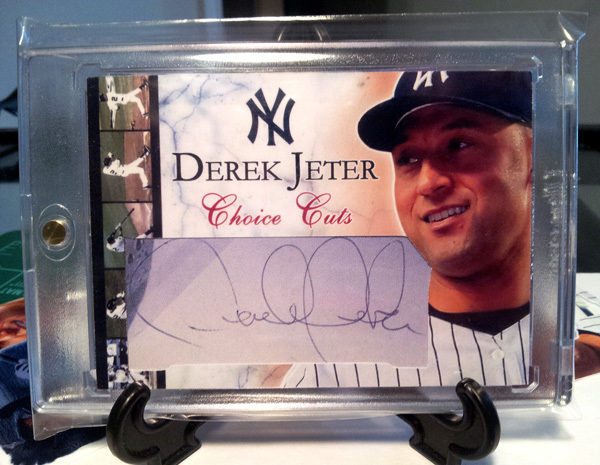 The film strip is of Jeter hitting his 3,000th hit (which was a home run, if you don’t recall – how cool is that? I remember embarrassingly letting out a loud WHOOOOP! when it happened at home.) I wanted the pics of him swinging on there. I feel it is a good mix of dark and light, with color. But then again – truth be told: I have not fully produced this card. For now, since it is just an art piece in my collection, I have it so I can take the autograph out and put a new design around it at anytime. For now though, I’m satisfied with this design. But … we are not done yet! 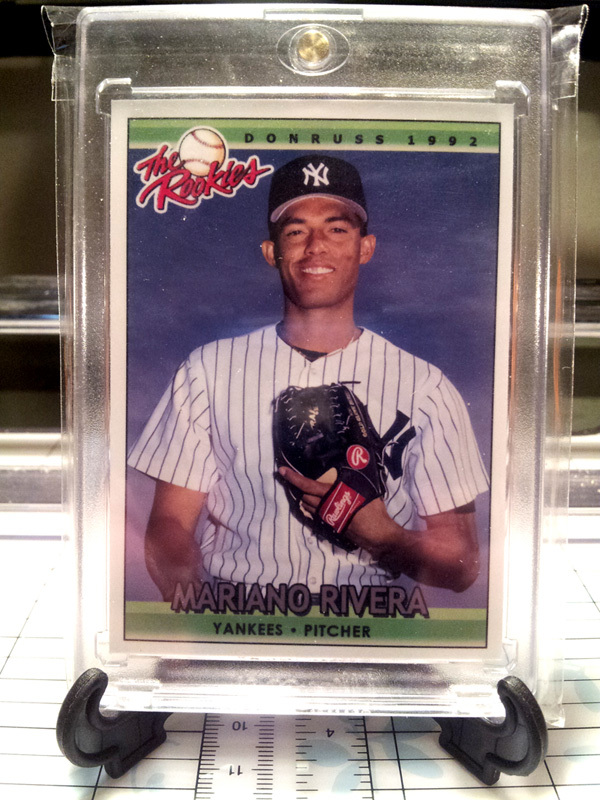 Over the past few days, I’ve been really toying with the idea of making some rookie cards of Jeter / Rivera that never were – actually, I have had some Jeter ideas for quite some time now, but instead of going to bed last night, I stayed up while listening to the A’s game (ironically enough, they were beating up the Yankees while I was making these cards!) and got to work. 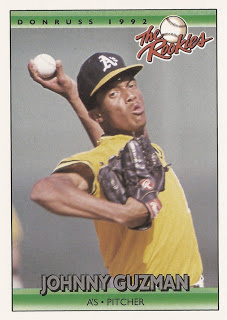 I wanted to go with a 1992 Donruss “The Rookies” style. I have a very specific memory of this set. My childhood was filled with moving many places, and aside from family, baseball / baseball cards were something I knew would always be there. No matter what state we moved to, I knew that I could grab some Topps, Donruss, Upper Deck, etc. 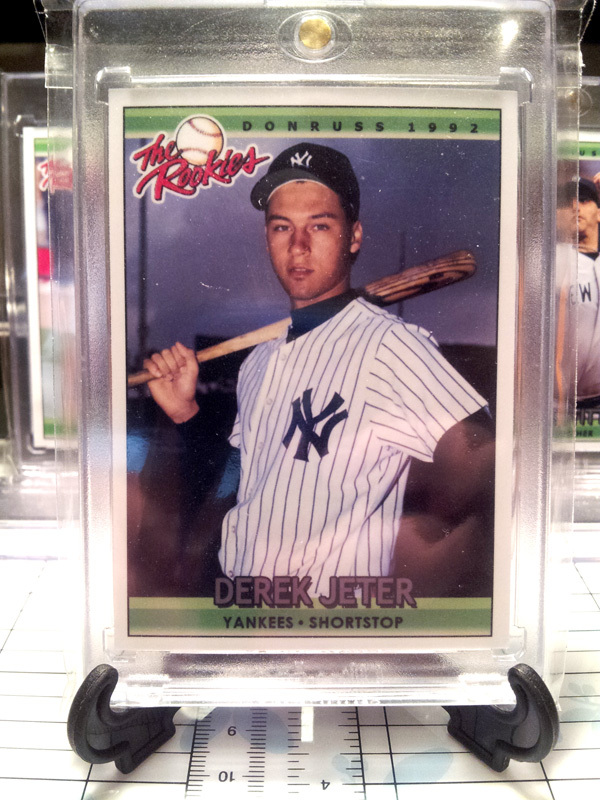 In my opinion, “The Rookies” sets by Donruss was always a marked improvement over their regular issue stuff. It may be for the simple fact that by the time they were produced, the population had been inundated with millions and millions of cards from their regular color scheme. Heck, if the regular issues were green, and the “The Rookies” set were blue, I may have STILL felt the same way! Anyway, the set is nice. Not expensive, but nice. You could probably grab one for $5-10. 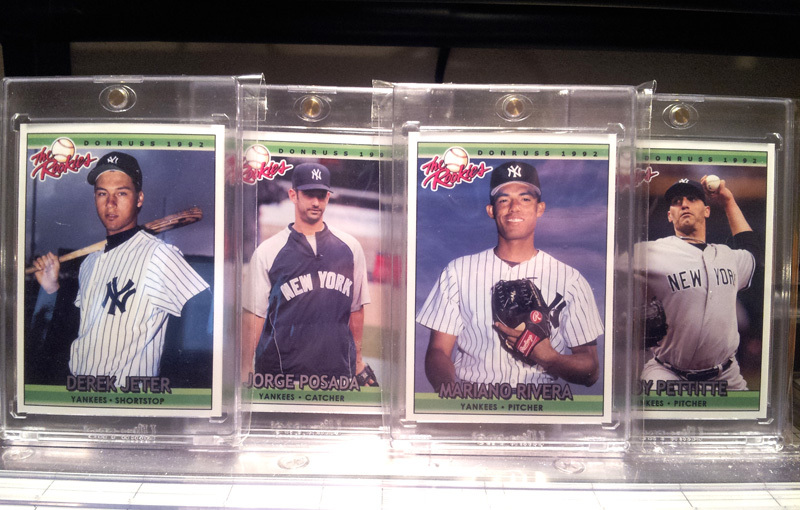 It has Manny Ramirez, Pedro Martinez, and Tim Wakefield, among others. 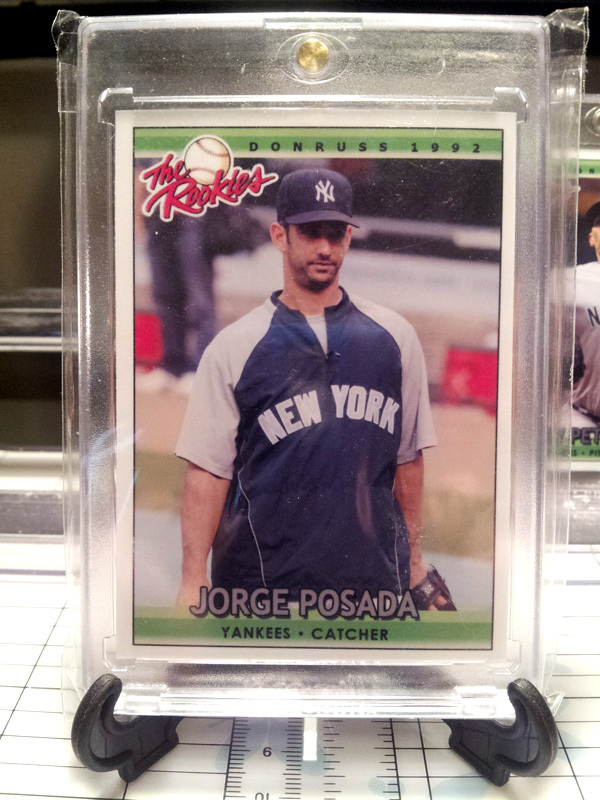 What if Posada were in it? 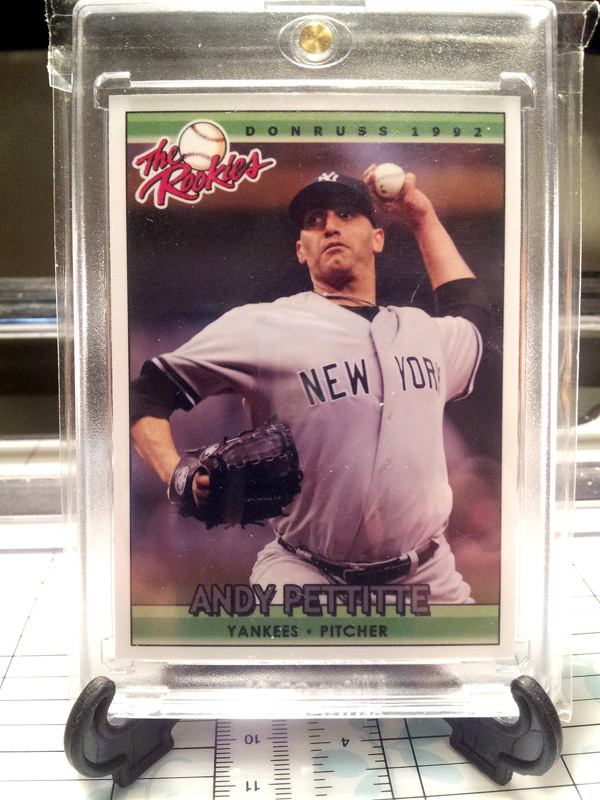 Pettitte? RIVERA??? JETERRRRRR???????? Look how young these kids are. Without these four young super stars, the Yankess wouldn’t be where they are today. Just watching them play, it is truly great to relive memories of Jeter tipping his helmet to the pitcher, Rivera taking his hat off for the fans, and Posada running out to the mound to consult with Pettitte on what to pitch next. I love making my own custom designs, but there is so much nostalgia wrapped up in existing cards, I think I will always love making “cards that never were”. Thanks everyone for reading, and Happy Father’s Day! Go have fun with your family!